All data is saved on the iPad or tablet and sent to your MailUp account automatically. In this way you can add to your recipient database wherever you are, even if you're not connected. You can customize your form with your logo, background, and texts in a few simple steps. All data is saved on the iPad and sent to your MailUp account automatically. Trade fairs, shops, conferences, and any other type of event. 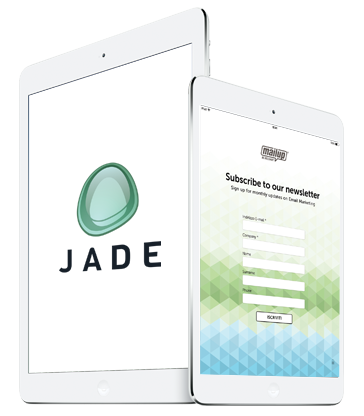 With Jade you can say goodbye to paper forms, notes, and business cards. On the counter or wherever you see fit. Expand the horizons of your email marketing with an iPad or tablet. Discover, through practical case studies, how our app helps companies achieve their goals. Present in 150 countries, Slow Food is a large non-profit association committed to studying, defending, and disseminating agricultural traditions, food, and wine from all over the world.